But on the first day of the week, at early dawn, they came to the tomb, taking the spices that they had prepared. 2 They found the stone rolled away from the tomb, 3 but when they went in, they did not find the body. 4 While they were perplexed about this, suddenly two men in dazzling clothes stood beside them. 5 The women were terrified and bowed their faces to the ground, but the men said to them, “Why do you look for the living among the dead? He is not here, but has risen. 6 Remember how he told you, while he was still in Galilee, 7 that the Son of Man must be handed over to sinners, and be crucified, and on the third day rise again.” 8 Then they remembered his words, 9 and returning from the tomb, they told all this to the eleven and to all the rest. 10 Now it was Mary Magdalene, Joanna, Mary the mother of James, and the other women with them who told this to the apostles. 11 But these words seemed to them an idle tale, and they did not believe them. We stand on a racing piece of earth. At the equator our rate of spin is about 1,000 miles per hour. Another rotation. Another day. And when enough days are done, we will have circled the Sun. Racing through space at 167,000 miles an hour. The resurrection of Jesus is the most monumental event in human history. It is, truly, earth shattering because it turns the world upside down. Suddenly, evil is vanquished and while the victory may not yet be complete, it is assured. For every defeat suffered in life we are given ultimate assurance that “all things work to the good.” Simply put, on Good Friday Satan thought the victory to be his. On Easter Satan awakens to a world made new. The victory Satan thought he had won in the crucifixion has been transformed into the means of his defeat. Christ, who Satan thought he had silenced, is risen and what Satan may have seen as weakness becomes a force that not even Hell can prevail against. That is the power of this day. But here’s the thing that also surprises me. Peter, the one who had denied Jesus, comes to the tomb and realizing what has taken place – that Christ has risen from the dead – does not seek out the disciples or shout victory from the rooftops of Jerusalem. Luke 24:12 tells us he went home. That surprises me. I would have thought he would have rushed to tell the other disciples what had transpired. Instead, home he goes. We’ll explore what that might mean for us today; for like Peter, we, too, must return home. 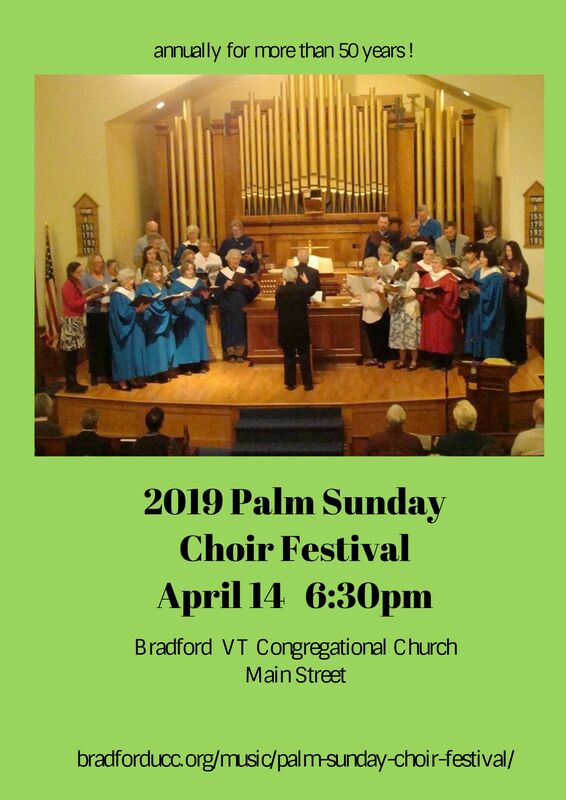 May 4th in our sanctuary, the North Country Chorus spring concert, Bernstein’s “Chichester Psalms” and Ravel’s “Requiem” plus the St. Johnsbury Academy Hilltones. May 17th in the vestry … our annual meeting. If you haven’t yet forwarded your annual report to Penny Perryman it needs to be sent now. This year’s Annual Report will be posted online (not mailed in paper form) with only a few copies printed for those who cannot access it online. We lift up in our prayers all who struggle, all who hurt, all who grieve, all who suffer, at home, across town, and around the world. The thought of Notre Dame cathedral of Paris is a reminder of how connected all of God’s creation is, and how much we can accomplish when we come together. We know the sordid details. 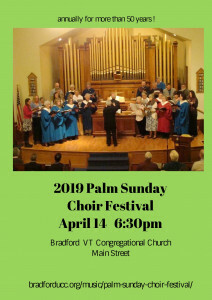 It started with “Hosanna, blessed is He who comes in the name of the Lord.” By Friday they will be shouting, “Crucify him.” Long ago and far away the tide of public opinion turned against Jesus. What began as a day filled with Messianic hope became a week of unrealized expectations. They had greeted Jesus as a conquering hero. They would send Him away defeated, despised and a criminal who had been convicted of thinking himself to be a king. We refer to Lent as a journey. It’s a time of cross over.